Mise en place: I’m a big Mark Bittman fan, and he figures that you should just get chopping and cooking without preparing much at all beforehand. Sometimes, though, I think his success as an author has made him forget how important organization and preparation can be for overcoming the difficulties of cooking in a small apartment kitchen. Mise en place just means preparing and arranging your ingredients so they’re ready to use the moment you need them. It’s not hard at all. With a single cutting board and a few stackable bowls, you can prepare every ingredient you need for your recipe before you even begin to cook it. Not only does this cut down on the need to rush around while the food is cooking (so that you’re less likely to mistake cinnamon for cumin), but it means that if you need help in the kitchen, your co-chef will be able to work in one place without bonking you over the head with whatever he or she needed from the cupboard. Magnetic knife strip: Having recently installed one of these, I’m at a loss for how I coped earlier. Every single knife I need is in plain sight and in arms reach. 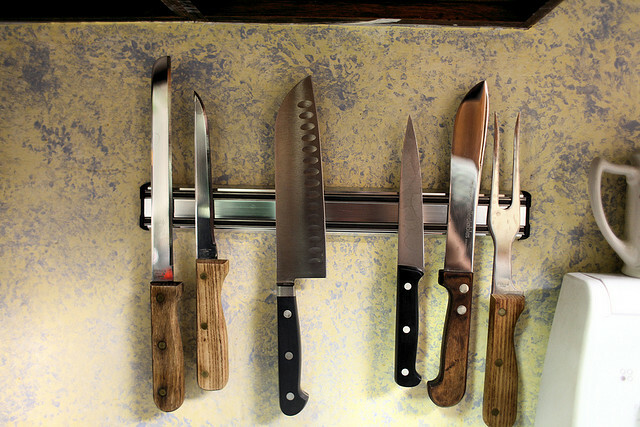 I’ve got a chef’s knife, a paring knife, a santoku knife, a boning knife and a butcher’s knife sitting securely on my wall on one single knife strip! That convenience adds up: while making cassoulet, a dish that requires too many different cuts of meat to keep track of, I saved myself four trips to what used to be the knife drawer. Hanging potracks: Noticing a trend, here? Having the things you need in cabinets, drawers, and other hard-to-access places does not help you attain a state of cooking zen. It also doesn’t make the most use of available space, and that includes looking up. Installing a hanging potrack requires either high ceilings or an unused corner of your kitchen, and it will keep your pots arms-length away. Immersion blender: A blender might just be the most awkward appliance in your kitchen. It’s usually too tall to fit in a cabinet, it has too many parts to simply disassemble and reassemble every time you need it, and you’re not likely to use it every day either. Solve your pureeing problems with an immersion blender. They’re smaller, cheaper, and just as powerful as any other blender – I even find they’re better suited to food processing tasks than traditional blenders are. 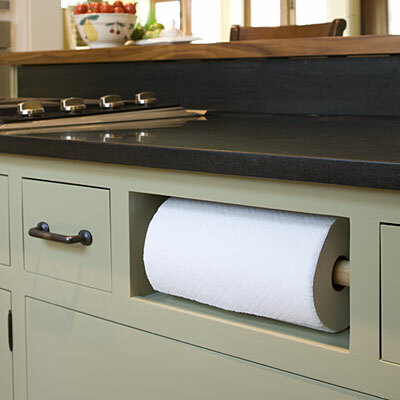 Under-the-sink paper towel holder: If you’ve got your landlord’s permission, this might be the coolest hack you can do to save some counter-space. You know that fake drawer directly underneath your sink? The one that looks like it should do something but doesn’t? It’s time to use it. A ‘can-do’ attitude. Consider your kitchen part of the exciting challenge of cooking. When you looked at that recipe for porchetta, you didn’t think it would be easy, did you? But you knew that if you conquered it, you would feel proud. Like every challenging recipe you’ve ever approached, there is a huge payoff to making your kitchen work for you. Just remember: you can make it work. Andrew is a Community Coordinator over at Appliance Help, where he writes about cooking, homebrewing, and DIY projects for the kitchen and beyond. His kitchen is really, really small. Thanks for the tips Andrew, I know I will be keeping a few of these in mind! If you or somebody you know would like to be a part of Featured Foodie Friday please e-mail me at savourthesenses (at) gmail (dot) com and we can get you scheduled! Great tips! I especially enjoyed the one about having the paper towels under the counter… just a new space! Thanks for sharing.